HVMN Ketone is partnering with professional cyclist Vittoria Bussi to break the world record for "The Hour" - a punishing quest to cover the maximum distance possible in sixty minutes. After missing the world record by only 404 meters in 2017, Vittoria Bussi is back for another attempt at the Hour on September 12 - this time fueling with HVMN Ketone. Learn more. In celebration, HVMN challenges you to pedal alongside Vittoria. 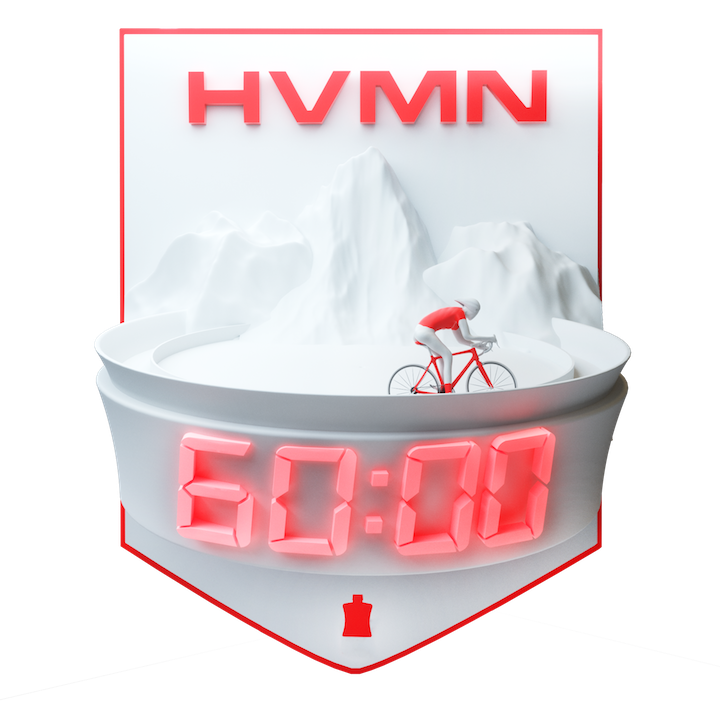 Complete a 60-minute ride and you'll be eligible for prizes from HVMN. All those who complete the challenge can enter to win HVMN Ketone - the world's first ketone ester, a superfuel for endurance athletes shown to increase performance in elite cycling time trials by 2-3% - to fuel your own record-breaking attempts. Want more? If you cover 47.98 km (29.81 mi) in a single ride, the distance of the current Hour world record, you could win a trip for you or a friend to San Francisco (home of HVMN, the Golden Gate Bridge, and some amazing cycling routes!). Push yourself to cycle for 10 total hours? One lucky winner will be travelling to Vittoria's training grounds, the famed Dolomite Mountains in Italy. Learn more about the prizes and watch the trailer for Vittoria's attempt here, and be sure to join the HVMN Strava Club for more Strava challenges with great prizes, news/updates on Vittoria, and the cutting edge of endurance nutrition. Good luck and happy pedaling! All cyclists who ride for one hour will score a digital finisher's badge for their trophy case. - U.S. cyclists who complete the 1 Hour challenge can enter to win one of ten 3-packs of HVMN Ketone. - U.S. cyclists who ride 47.98 km (the current Hour world record) or more in one session can enter to win a trip to San Francisco. Don't worry - you can take longer than an hour for this one. Already in San Francisco? HVMN will fly your favorite long distance cycling buddy out to ride with you. - U.S. cyclists who ride a total of 10 hours during the week of September 6-12 can enter to win the Grand Prize - a trip to Italy to ride Vittoria's training grounds in the famed Dolomite Mountains. All U.S. athletes must follow the link sent by email upon completion of the 1 hour ride to opt-into the prize draws. Your eligibility for all three tiers of prize draws will be automatically verified upon the end of the challenge period. 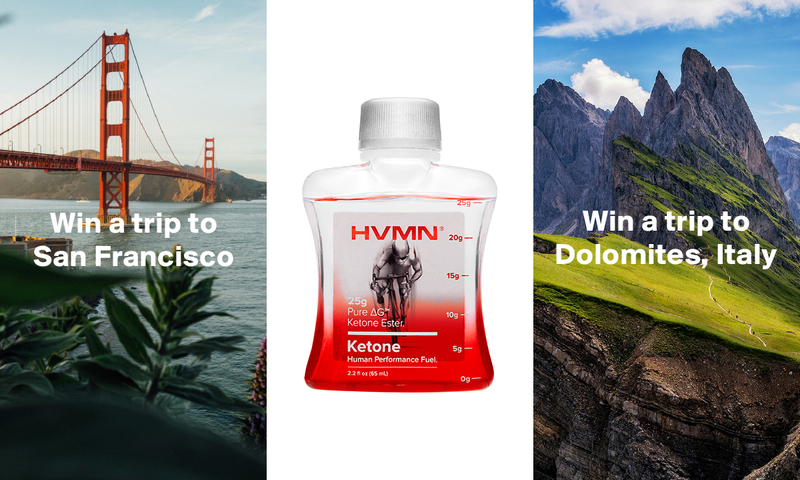 The more you ride the better your chances to win prizes from HVMN: HVMN Ketone, a chance to visit San Francisco, and even a trip to Italy! All activities logged during the challenge period (September 6-12) must be uploaded to Strava no later than three days after the challenge ends (11:59pm on September 15). The content in this challenge is the sole expression of HVMN. To learn more about how to use Strava, please visit the Strava Support Center or email support@strava.com. All other inquiries should be directed to HVMN. Prize eligibility and fulfillment is at the sole discretion of HVMN. No purchase necessary to enter or win. A purchase will not increase your chances of winning. Void where prohibited. Begins 9/6/18 at 12:01AM and ends 9/12/18 at 11:59pm. Open to 18+ in the US only. Must have Strava account to participate. For full terms and conditions: https://help.hvmn.com/company/hour-challenge-terms-conditions.